At SRU, we know teamwork helps our graduates succeed. Real world application of classroom education is key. Our students are trained on the same equipment professionals use. Slippery Rock University's Biology program is perfect for those with a passion for nature, research, and learning about different life systems. With both Bachelor of Arts and Bachelor of Sciences degrees in Biology available, as well as a minor, you can pursue a path that best fits your interests. At SRU, you'll learn about life systems in the classroom, field, and laboratory (our facilities include a freshwater aquarium room and a greenhouse). You'll also develop important analytical and critical thinking skills and gain vital research and collaboration experience. There are many opportunities for Biology students to get involved with clubs and organizations as well. Slippery Rock is home to a chapter of the National Biology Honorary, Beta Beta Beta. There are many other clubs to join on-campus too, such as the Pre-Med Club, Pre-Occupational Therapy Club, and Pre-Veterinary Club (PALS). Slippery Rock University's Biology program gives students hands-on experience, internship opportunities, and a seamless path to graduate school. Interested in learning more about the program? Request more information today! 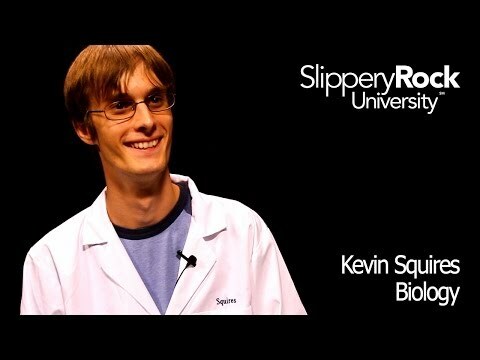 Kevin Squires is a biology major at Slippery Rock University. He is actively involved around the campus at SRU. Kevin is involved in organizations such as the Slippery Rock Orchestra and Beta Beta Beta. In addition, he is an orientation ambassador, assistant editor of the Rocket, a pride guide, and he is also one of the founding members of the new Harry Potter club. Kevin is currently doing biology research with one of his professors, Dr. Hrizo. In the video to the left, Kevin talks about how his professors inspire him to follow his dreams and pursue his passions.